Many offices these days have numerous devices such as computers, photo copiers etc that all give off heat. This is not a great problem in larger offices but in smaller offices where space is at a premium with large numbers of computers and desks close together the room can quickly become to warm and some form of air conditioning is required to keep the office environment at a pleasant temperature level. The best way to operate these types of devices is in automatic at a set temperature of say 21 degrees. Modern inverter driven systems have the ability via the indoor unit sensors to sample the actual room temperature and then switch to either cooling or heating aromatically to maintain the room temp. The inverter driven technology is utilised in the outdoor unit to drive the electric motor that in turn drives the compressor. It is the ability of the control electronics that drive the motor to infinitely vary speed that makes these types of systems so energy efficient. This type of control uses the minimum power that is constantly monitored to maintain temperature with minimum power consumption only ever used. If you need to work out the cooling or heating requirements you can use the following rule of thumb. As long as your ceiling height is below 3.2 meters you will require one kilowatt of heating and cooling power for every ten square metres of room size. So a room of fifty square meters will require five kilowatts of power to maintain temperature. 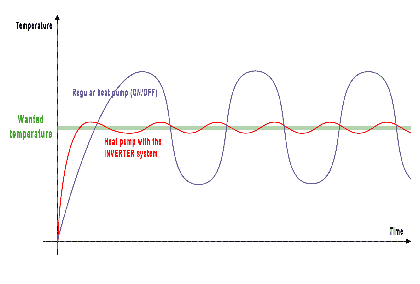 As you can see by the graph to the left the output temperature of the air conditioning is constantly monitored and adjusted by the inverter control, in small segments. Utilising this principle ensures the system closely controls the required temperature, with the minimum amount of input power consumed.